Irvington, NJ – Using the tennis courts in Essex County Irvington Park as the backdrop, Essex County Executive Joseph N. DiVincenzo, Jr. announced that the tennis courts in Irvington Park and Weequahic Park, and the basketball courts in Ivy Hill Park and Monte Irvin Orange Park will receive facelifts with new asphalt playing surfaces, equipment and fencing on Wednesday, April 11th. The project is part of the Executive’s ongoing initiative to modernize recreation facilities and ensure the Essex County Parks System continues to meet the public’s needs. “Our parks are the centerpieces of our communities and our fields, courts and playgrounds are the backyards of our neighborhoods. That is why we have continued our commitment to making sure our open spaces are up to date and able to meet the needs of our children and residents,” DiVincenzo said. “This spring, we are renovating outdated and worn recreation facilities and installing modern playing surfaces and equipment,” he added. “Thank you for supporting Irvington and standing with us as we revitalize our community,” Irvington Mayor Tony Vauss said. “The example set by the County Executive is one of teamwork, and that is how we are getting things done,” added the Mayor, who was joined by Council members Renee Burgess, Dr. October Hudley and Vern Cox. Irvington Park Tennis Courts, which were last upgraded in 2004. Ivy Hill Basketball Courts, which were last upgraded in 2005. Monte Irvin Orange Park Basketball Courts, which were last upgraded in 2006. Weequahic Park Tennis Courts, which were last upgraded in 2004. Each facility was experiencing regular wear and tear, and will receive a new playing surface and equipment. Members of the public and other elected officials looked forward to the completion of the four courts. “These are fantastic projects for the County. No one else around the state is doing what Essex County is doing to invest in our parks and open spaces,” Freeholder President Brendan Gill said. “This is a beautiful park, and it’s very unique because it’s big enough for families but small enough for children,” Freeholder Lebby Jones said. “This park is very special and wonderful things are taking place here,” Freeholder Patricia Sebold said. 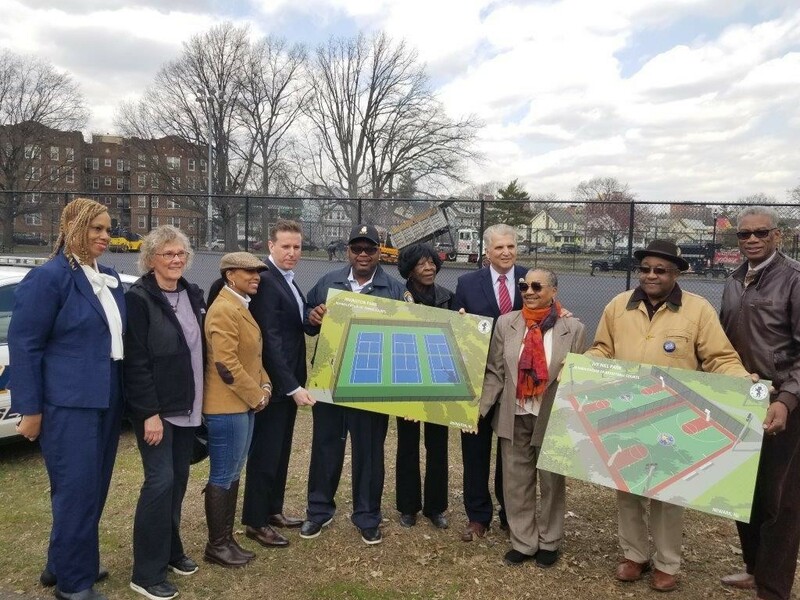 “Thank you to the County Executive and Freeholders for making the needed and necessary upgrades to our facilities in Ivy Hill Park,” said Houston Stevens, President of the Ivy Hill Neighborhood Association. “The basketball courts are well used and the community is looking forward to the new playing surface,” he noted. “I attended Irvington Tech many years ago, and we always came to Irvington Park. I can tell you that today it is better that it was,” Sheriff Armando Fontoura said. Picerno-Giordano Construction, LLC from Kenilworth was awarded a publicly-bid contract of $761,200 to perform the construction work. The Essex County Department of Public Works designed the improvements in-house and will monitor the projects to ensure delays are avoided. The upgrades are being funded through the Essex County Capital Budget. They are scheduled to be completed in the summer of 2018.